The largest sinkhole of the world is Xiaozhai tiankeng – incredible, up to 662 m deep pit with nearly vertical walls. This is one of the most impressive natural attractions on Earth. Since recent times scientists have proposed a special name for especially large sinkholes – tiankeng. This could be translated from Chinese approximately as "heavenly pit" or "sky hole". 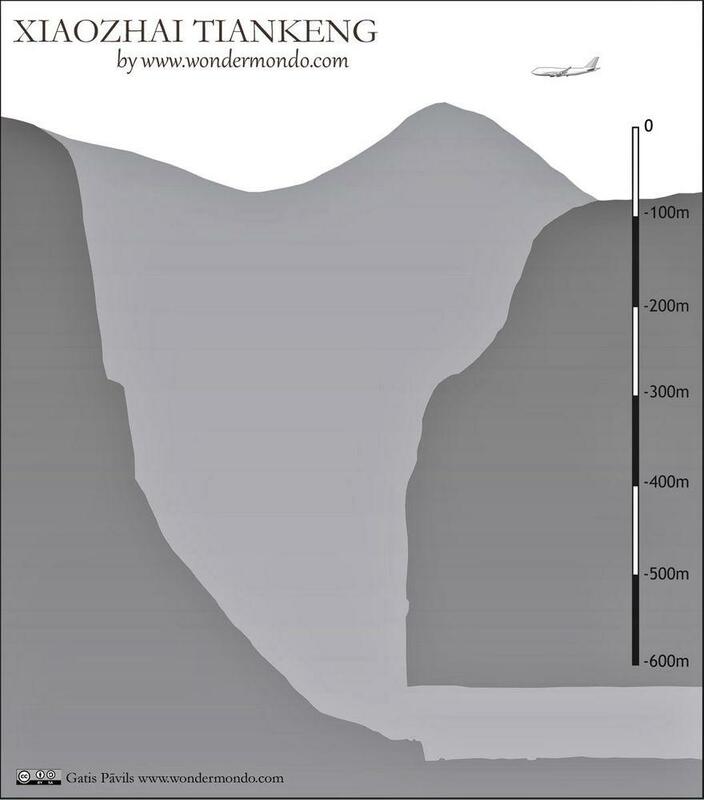 Tiankeng is giant sinkhole with vertical walls, at least 100 m deep and 100 m wide. Most often bottom of tiankeng is crossed by an underground river, which is open to daylight only here. 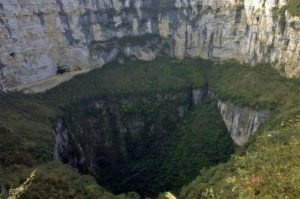 Such structures are found in several countries (Papua New Guinea, Malaysia, Mexico) and, for example, in Mexico, such giant holes are called – sótano. 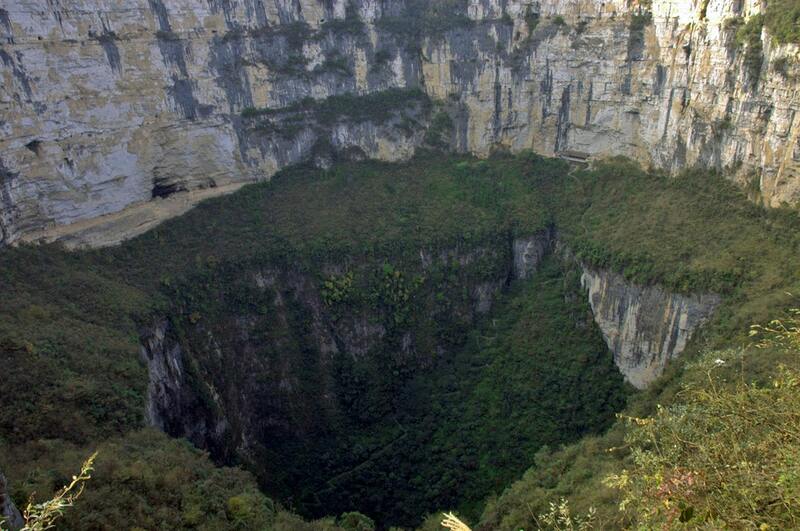 But out of some 75 giant sinkholes of the world some 50, including the largest ones, are located in China. Thus to large extent, this is truly Chinese term for Chinese phenomenon. First tiankengs were documented in China in the early 1980s. Term "tiankeng" was proposed in October 2001 by Zhu Xuewen, China Cave Study Association and Institute of Karst Geology in Guilin. Nearly all tiankengs have developed in carbonate rocks with the noble exceptions of Sima Humboldt and Sima Martel in Venezuela, which have formed in sandstone. Like other sinkholes, tiankengs are formed by karst processes (in carbonate rock) or suffosion (in sandstone). In karst processes rock is dissolved and carried away by flowing water, suffosion is a similar process, where particles of sandstone or similar rock are carried away by water. There is needed extremely thick and very clean layer of carbonate (or sandstone) rock. The thickness of rock should be at least 200 – 300 m. Any layer of impurities will distort the process of formation. Layer of carbonate should be above the sea level. It is even better if the area is raised by tectonic processes. Thus, for example, Nakanai mountains in New Britain (Papua New Guinea) rise by some 3 mm in a year, also in China, the areas with tiankengs are rising. There is needed lots of rain. In areas with carbonate rocks, this inevitably leads to the formation of underground rivers. If the limestone layer is raised high, these rivers are flowing several hundreds of meters below the surface. If this is in place, nature does its work and tiankeng is formed. In most cases there form collapse tiankengs – here underground rivers form giant underground rooms which at some moment collapse until former cave room is turned into a vertical pit. The water of powerful underground river dissolves the rock debris and carries it away. There are known cases when erosion tiankengs develop – like Houping Tiankeng cluster (Chonqing Municipality). These giant holes are created by the source of underground rivers – here small streams fall through the many hundred meters thick limestone layers until they reach the impermeable rock. Then these streams continue like underground rivers. Gradually at this entrance is formed a hole which then increases up to incredible proportions. Nowadays such erosion tiankengs have beautiful waterfalls falling in them. Tiankengs seem to be more shortlived than most other geological features. Initially, tiankeng forms as a smaller hole above the giant cave collapse, then this hole widens until the walls are vertical. Then walls gradually erode and former tiankeng turns into forest-covered, enormous bowl-shaped depression. Tiankengs belong to most spectacular geological formations of the world and often house important biological values. Xiaozhai tiankeng was discovered by specialists in 1994 during the search of new exploration site for British cavers in the China Caves Project. In fact it was well known to local people since ancient times. Next to this sinkhole was located a small village – Xiaozhai. The name of village in translation just means "little village". Nowadays it is abandoned. Already in Chinese classical works frequently are mentioned mysterious and deep ravines – possibly they describe tiankengs. Xiaozhai tiankeng has incredible size. This hole is 626 m long and 537 m wide. Total depth is 511 – 662 m. Area of opening is 274,000 m², volume – 119.348 million m³. All these millions of cubic metres have been dissolved and carried away by the river. Sinkhole is double nested structure – upper bowl is 320 m deep, lower – 342 m deep and 257 – 268 m across. Between both these steps is sloping ledge. This ledge has formed due to muddy, "dirty" layer in limestone. In wet weather there is seen waterfall falling into tiankeng. This is one of three very large tiankengs worldwide – the other two are Dashiwei tiankeng and Haolong tiankeng (both in China). Tiankeng has formed over the Difeng cave, which in turn has been formed by a powerful underground river. This river still crosses the bottom of tiankeng. Underground river starts in Tianjing (Tiangjingxia) fissure gorge and reaches the daylight in the vertical cliff above the Migong River, falling like a waterfall 46 m high. The whole length of this underground river is approximately 8.5 km and during these 8.5 kilometers, it falls 364 meters. The average annual flow of the river is 8.77 m³ per second, but flowrate can reach even 174 m³/s. This steep, powerful river has created the world’s largest sinkhole. River and Difeng Cave have been explored and mapped in 4 km length by China Caves Project in 1994. Tiankeng is located in 280 km² large karst area, formed by lower Triassic limestone, Jialingjiang formation. The limestone here is extremely pure and even separate layers are not visible: it just a monolithic, very thick block of pure limestone. This tiankeng most likely formed over the last 128,000 years. For the most part of this time, it was an underground void, which gradually increased. The ceiling of this giant cave room collapsed several tens of thousands of years ago. Not too far there are six more tiankengs – all other tiankengs in this area seem to be older than Xiaozhai. 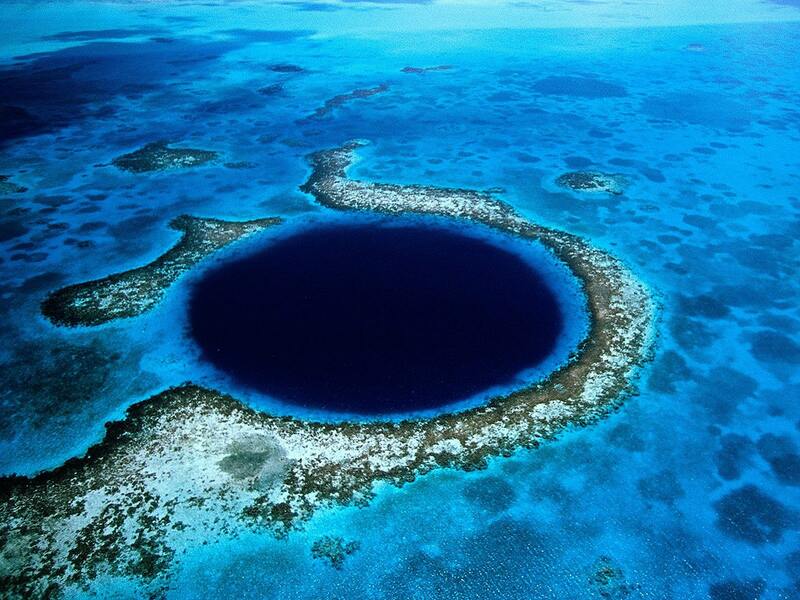 Bottom of this sinkhole is large enough to sustain small, isolated world full with life. Here have been registered 1,285 species of plants, including such rare plants as ginkgo (Ginkgo biloba L.) and many rare animals like clouded leopard (Neofelis nebulosa Griffith, 1828) and many others. 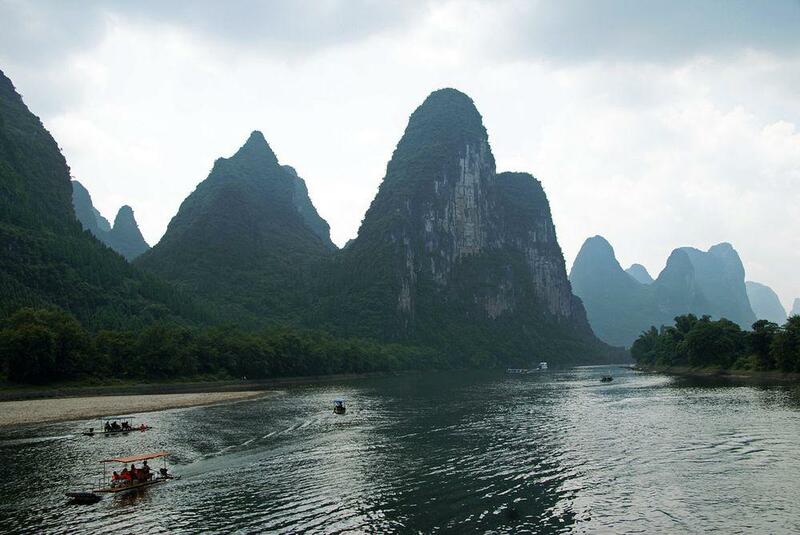 Xiaozhai tiankeng belongs in league of the most magnificent natural attractions of the world. We can be sure that it will be the desired destination for countless foreign tourists as well. Domestic tourism in China is flourishing and starts to bring good profit to rural people. Thus any exciting attraction here turns into real economic value. Earlier Xiaozhai tiankeng was nearly inaccessible, but the incredibly fast development of China over the last decade has brought many new roads in this area. Here has been developed also a zig-zag pathway with 2,800 steps descending into the tiankeng.